Only minutes to the resort, this adorable cabin is a great getaway year-round. After a day of mountain activities enjoy modern conveniences like Wi-Fi, satellite TV on flat screens, and full-size washer and dryer in this classic Angel Fire cabin. 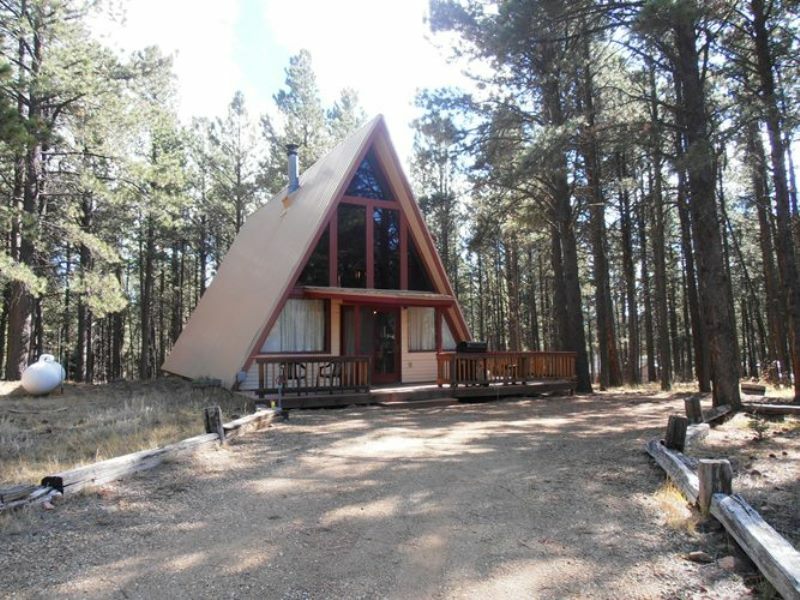 Two sides of this A-Frame cabin have wide decks, perfect for viewing the abundant deer and elk in the neighborhood. This house not only sleeps six but accommodates everyone for dining at the coolest 70's style dinner table that you have ever seen! There is a great kitchen to cook and entertain in. Put the kids upstairs and enjoy the master bedroom with a new bed and a bath attached. This cabin is equipped with modern heat as well as a lovely wood stove. Angel Fire's Country Club is just down the block - enjoy cross-country skiing, sledding, golf, tennis and a lively nightlife.We love this cabin and know that you will too! Only minutes to the resort, valet the skis and stay in this adorable cabin. With easy access and fields of snow surrounding, this is the perfect winter get away.